How? 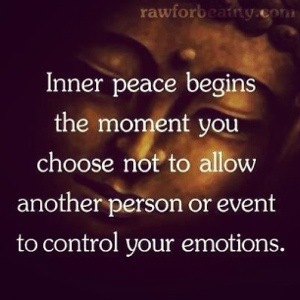 How is this actually possible to achieve inner peace? To allow peace and love to flow from us and to never be effected by our emotions or the words from others. The ability to walk away. When someone effects you, it is as if at that one moment you are driving the car on the highway and then the next moment you decide to ask the person or child to take the wheel. You hand them total control. You would never do this. EVER!! But we choose to do this over and over again with our emotions. I did this exact thing tonight with my ex-husband. A little voice said “why are you doing this?” So I hung up, walked away, read, breathed and then started over. I must accept that the most challenging people we know are OUR MEDITATION. If we simply surround ourselves with loving understanding people we will never truly master this meditation. So in small doses- always remember your true self. Now smile during the traffic jam and take that time to sing your favorite song. This entry was posted in Uncategorized and tagged Birth, HypnoBirthing, Meditation, parenting. Bookmark the permalink.